CHIAVARI, Italy – It’s no secret that Italians are particularly gifted in the art of creating beautiful things, some call it “that fine Italian hand”. For example: Italians can take a piece of green wax, carve it into a prototype for a piece of jewelry, do a little abracadabra magic and next thing you know you are staring at a dazzling little masterpiece in gold that takes your breath away. As you probably guessed I’m talking about goldsmithing, one of the arts the Italians have put their fine Italian mark, as well as their hands, on. The goldsmiths of Crotone, and there are at least 30 of them in this southern town of 60,000 in Calabria, pride themselves on continuing a tradition that was brought there by the Greeks after they settled there in 710 B.C. In Crotone you can trace a line from the artistry of goldsmithing today directly back to the town’s Greek heritage. It may be a little more commercial these days, or more focused on jewelry than the old Greeks were, but the techniques and traditions are pretty much the same. Every very piece of jewelry starts with an idea, an idea which eventually translates into a design sketched out on paper. Then a wax model is created from that design. The wax model gives the artisan an idea of what the finished piece of jewelry will look like and also serves as the mold for the piece. Today there is new 2D and 3D technology that lets the artisan see his/her creation in actual size and proportion, but back in the annals of antiquity the wax model was all the Greeks had to go by when they were working in precious metals. But even with all the new hoopdeedo gadgets available to goldsmiths there is still enough manual labor built into the process that allows the Italians to follow the ancient Greek traditions and still do what they do best, which is create beauty. The Greeks made jewelry too but they were actually a little more interested in creating sacred art and votive offerings, which were used like votive candles are in our churches today. 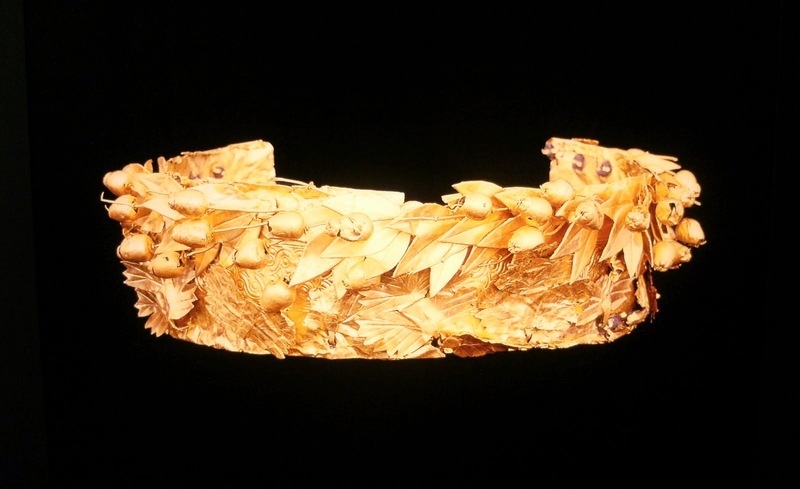 Some of their work, including the famous Golden Tiara, was found in the excavations at the Sanctuary of Hera Lacinia in the Archaeological Park of Capo Colonna, near Crotone. The Golden Tiara, or Crown of Hera, is said to have come from a statue of the goddess Hera Lacinia, the wife of Zeus, the most powerful god in Greek mythology. The tiara is considered the most perfectly preserved artifact from this period. There is an important goldsmithing school in Crotone, the Scuola Mediterranea d’Arte Orafa, the Mediterranean School of the Art of Goldsmithing. 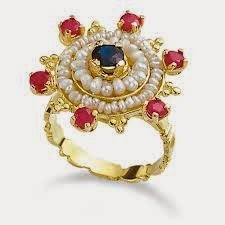 It was started by Gerado Sacco, one of Italy’s best known goldsmiths/jewelry designers. Sacco is a man who knows a thing or two about working with precious metals. When he first opened his laboratory workshop in Crotone he began specializing in pieces inspired by the Magna Grecian culture, and through that work he brought back the artisan techniques of the past. The same year he produced his first designs he won First Prize at the Goldsmith’s Exhibition in Florence, and the Craftsman’s Oscar at an exhibition in San Remo, Italy. His pieces have been exhibited in the Vittoriano Complex in Rome and in the Vatican Museum. To keep the ancient traditions alive, the students at his Scuola Mediterranea d’Arte Orafa have to study the History of Art. Cultural Anthropology, History of Mediterranean Civilizations and Calabrian Sacred Art along with the Economic Geography of the Mediterranean. But wait, there’s more. Also on the curriculum are Sacred Objects of the Past and Decorating Tools of Calabrian Peasant Art. But don’t get the idea that all they do is wallow around in the past, down there in the south. Far from it. The school is also equipped with all the latest bells and whistles available to goldsmiths. 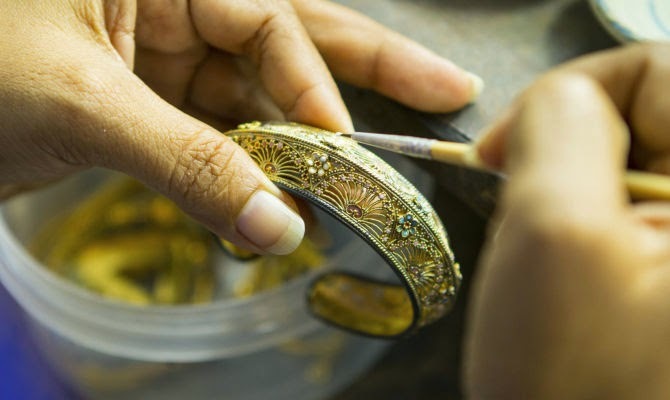 And while theory and technique are all fine and good, in the end goldsmithing is a profession and needs to be managed so there is a special emphasis on quality procedures and management training. I don’t want you to think that Crotone is the only goldsmithing school in Italy. It isn’t. There are schools in many other cities including Florence, Rome, Salerno, Valenza and Vicenza just to name a few, all valid, all good. But there is something about the goldsmithing traditions of Crotone that appeals to me, or it just may be my innate weakness for all things southern – southern Italian that is. And I think it all circles back to those fine Italian hands and the beauty they create. And just in time for Christmas, too! Another fascinating piece! I want to go there now!